1. If there are uneducated individuals within the organization, which there will be, then educate them! Explain what SEO/SEM is, how it works and share case studies/results to get them on board. 2. Identify internal champions of Search and give them the tools to help educate others in the organization. This will ensure that positive information about Search is coming both from the agency and within the organization. 3. Host a training session to empower them. This has added benefits as it will help the program grow if all communications are written with SEO in mind. 1. Repeat steps 1-3 above. 2. Traditionally the more work that is involved = more resistance. Outline the program and break it down into manageable chunks. 3. Conduct competitive research and help them understand that search is vital to helping the company grow and staying competitive within the marketplace. 4. If the above doesnâ€™t work, talk to the individual one-on-one to address his/her specific issues, answer questions and present the case for search. Make sure this is one-on-one so others arenâ€™t affected. 1. Present the business case for the updates being asked of them. i.e. Search Engines canâ€™t crawl the site, keeping the site from ranking and minimize opportunities to increase traffic. Remember â€“ they want to help the company too. 2. Identify low hanging fruit. Again, outline the technical requirements and present a couple easy ones first to build confidence and so the team can celebrate successes. IT departments often feel overworked and underappreciated; a thank you goes a long way. 3. Prioritize the Fixes and the Benefits of each. Donâ€™t start them out with a fix that takes hours and provides little benefit. My experience, working with large organizations, is that education is the first step. Help them understand what weâ€™re doing, why weâ€™re doing it and how it will benefit them and their part of the organization! 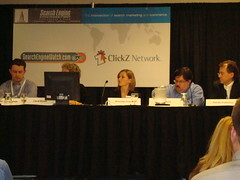 Amanda Evans, Senior Search Consultant, WebMama.com, Inc.
Find more images from SES Chicago. Nice coverage of a complex subject. Find allies, educate them and turn them into an evangelist. Basically make them look good to their bosses and you’ll have an advocate. You’re absouletly correct the first step and in fact every step after that is all about education. LOL, that’s my ear in the picture! Anyway, I don’t understand why Carol Kruse was allowed on stage. Go search Google for coke – missing meta description. Go search Google for coke rewards – missing meta description. Go visit the official coke store – long URLs with unnecessary folders (http://www.coca-colastore.com/coke/coke/jump/product/W20172/Heritage_London_5_x_7_Photo_Frame.html). Almost all of Coke’s websites are created in Flash. A co-worker was in the Issues Track for the entire day and in one of his sessions a panelist even mentioned Coke.com as a bad SEO example page! The best part of all was when Carol claimed she had hired, “The best in the industry for SEO and PPC” – what a joke!